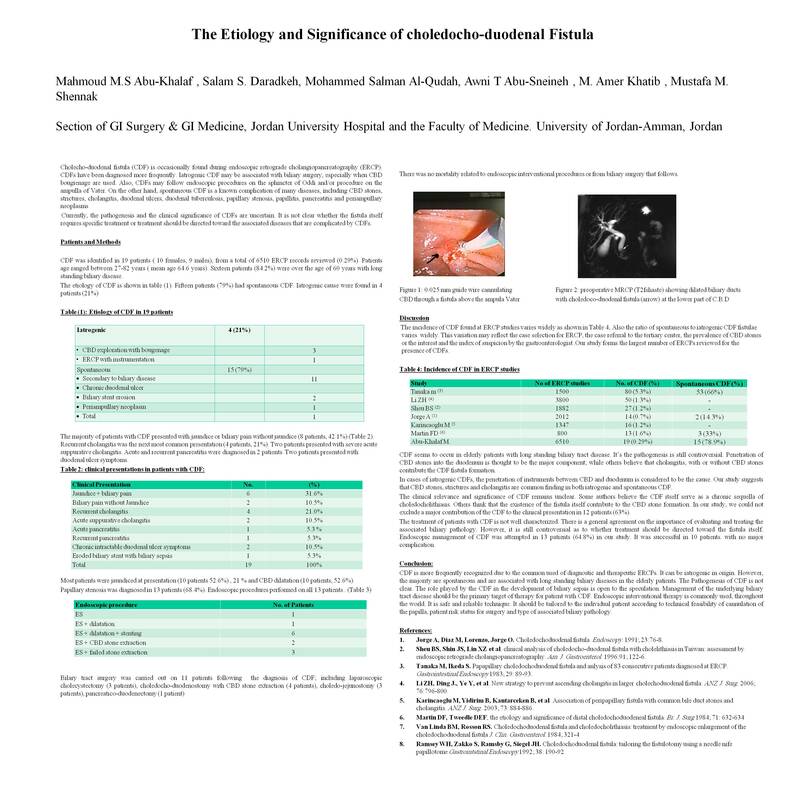 Background: the etiology and the clinical significance of cholechoduodenal fistula (CDF) is still a controversial issue. It is controversial whether patient management should be directed toward the associated biliary disease, or to the CDF or both. Methods: the endoscopic retrograde cholongiopancreatography (ERCP) records of 6510 patients managed at the gastroenterology unit of Jordan University Hospital, Amman, Jordan over 23 years period were retrospectively reviewed for the presence of CDF. We identified 19 patients with CDF and their notes were retrospectively reviewed for demographic data, clinical presentations, laboratory data, surgical and endoscopic management. Results: CDF was identified in 19 patients (10 females, 9 males) from a total of the 6510 patients (0.29%). Patients ages ranged between 27-82 years (mean age 64.6 years), sixteen patients (84.2%) were over the age of 60 years and with long standing biliary disease. Fifteen patients (79%) had spontaneous CDF. A primary biliary disease as an underlying cause for the CDF was identified in 11 patients (57.9%). Iatrogenic causes were found in 4 patients (21%). Obstructing periampullary adenocarcinoma, biliary stent erosion, and penetrating duodenal ulcer disease were rare causes for CDF. Patients presented clinically with jaundice and biliary pain (6 patients), painless jaundice (2 patients), recurrent cholangitis (4 patients) and acute suppurative cholangitis (2 patients). Two patients presented with duodenal ulcer symptoms. Most patients were jaundiced at presentation (10 patients, 52.6%) or gave a history of jaundice (5 patients, 26.3%). Seventeen patients (89.5%) did have an elevated Gamma-glutamyl transpeptidase (GGT) and / or alkaline phospahatase. CDF did contribute to the clinical presentation of our patients in 12 cases (63%). Biliary tract surgery was performed in 11 patients (57.9%) after the ERCP diagnosis of CDF. Endoscopic interventional procedures on the CDF and / or papillary sphincter were carried out in 13 patients (68.4%). Both biliary tract surgery and endoscopic intervention were associated with zero mortality and low morbidity 4 patients (21%).